(7) Any additional information requested by the Administrator or the Administrator's authorized representative. (b) To the extent that information required for a re-certification of compliance remains valid and has been submitted in previous certification or re-certification applications(s), such information need not be duplicated in subsequent applications; such information may be summarized and referenced. Information documented in each Compliance Recertification Application (CRA) is prescribed in 40 CFR § 194.15 (U.S. EPA 1996). These documentation requirements parallel the requirements of 40 CFR § 194.14 (U.S. EPA 1996), which apply to the original application, the Compliance Certification Application (CCA) (U.S. DOE 1996). The focus of section 194.15 is to ensure that each CRA includes documentation regarding any changes to the disposal system that may have occurred since the previous certification or recertification. Updated information regarding relevant aspects of the waste and the disposal system is documented. However, in cases where information and assumptions have not changed, no new information needs to be documented; a CRA may reference or summarize such unchanged information. Each CRA must identify relevant systems and program changes implemented during the preceding five-year period. Any activity or assumption that deviates from what was described in the most recent recertification application would be considered a change. Each CRA also documents changes reviewed and approved by the U.S. Environmental Protection Agency (EPA) in the preceding five-year period (through modification of the certification or other processes). Each CRA documents instances where new baseline program elements were established as a result of changes. The CCA, Chapters 2.0 and 3.0 and Appendices GCR, HYDRO, and MASS, include general information about the Waste Isolation Pilot Plant (WIPP) site and disposal system design and specifically support section 194.14. Other site characteristics, design, location, and construction information is primarily provided in the CCA, Chapter 7.0 and Appendices BACK, DEL, PCS, and SEAL, which also specifically support section 194.14. All other chapters and appendices of the CCA are not specifically relevant to section 194.14. After its review, the EPA concluded that the U.S. Department of Energy (DOE) adequately addressed the geology, geophysics, hydrogeology, hydrology, meteorology, climatology, and effects of waste and geochemistry of the disposal system and its vicinity, and how these conditions are expected to change and interact over the regulatory time frame (Compliance Application Review Document [CARD] 14, U.S. EPA 1998a). 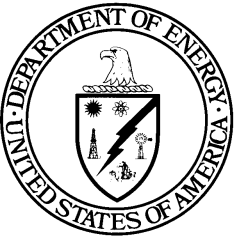 The EPA reviewed the DOE's CCA and additional information submitted by the DOE and determined that the DOE complied with each of the criteria of section 194.14. A complete description of the EPA's 1998 Certification Decision for section 194.14 can be found in U.S. EPA 1998b, as well as CARD 14 (U.S. EPA 1998a). Baseline documentation for section 194.14 was established at the time of the original EPA certification. Information on changes to section 194.14 topics that occurred since the original certification is required to be documented by section 194.15. Changes that occurred during the five-year period following the original certification are documented in the CRA-2004 (U.S. DOE 2004), which was submitted by the DOE and reviewed by the EPA under the requirements of section 194.15. During public review of the CRA-2004, the EPA received comments regarding karst features, vertical fracturing, and transport through the Magenta Dolomite Member. The EPA assessed these comments and concluded that the DOE has demonstrated continued compliance. The EPA responses to comments on the CRA-2004 are documented in CARD 14/15, Appendix 15-A (U.S. EPA 2006a). Based on a review and evaluation of the CRA-2004 and supplemental information provided by the DOE (available for review in EPA Docket A-98-49), the EPA determined that the DOE continued to comply with the disposal standards (U.S. EPA 2006b). Baseline documentation for section 194.14 was established at the time of the original EPA certification. Information on changes to section 194.14 topics that occurred since the CCA was documented in the CRA-2004 (U.S. DOE 2004). Changes that occurred during the five-year period following the CRA-2004 were documented in Section 15 of the CRA-2009 (U.S. DOE 2009a), which was submitted by the DOE and reviewed by the EPA under the requirements of 40 CFR 194.15. The EPA provided opportunities for public comment throughout the recertification process. Public comments received during the CRA-2009 public comment period, along with the EPA's responses, are documented in CARD 14/15, Appendix 15-C (U.S. EPA 2010a). The EPA responses to hydrologic comments are documented in CARD 14/15, Appendix 15-B (U.S. EPA 2010a). Based on a review and evaluation of the CRA-2009 and supplemental information provided by the DOE (available for review in Federal Document Management System Docket ID No EPA-HQ-OAR-2009-0330, Air Docket A-98-49) the EPA determined that the DOE continued to comply with the disposal standards (U.S. EPA 2010b). The EPA assessed all of the public comments received and concluded that the DOE demonstrated continued compliance. To document that the WIPP continues to comply with the disposal standards in each five-year recertification cycle, changes and new information and their impacts on compliance since the previous recertification must be described. Changes and new information since the CRA-2009 related to 40 CFR 194.15 are either described below, or references are provided to other sections or appendices of the CRA-2014 that provide the necessary information. Much of the information provided in this section was obtained from routinely published reports. Table 15-1 lists these reports and summarizes the type of information contained in each report. The specific reports referenced in Table 15-1 are the latest annual or biennial versions submitted to the EPA or published for the EPA's review before this CRA's cutoff date of December 31, 2012. Describes compliance status with applicable environmental laws and regulations and environmental monitoring performed during the year at the WIPP. Highlights any significant monitoring results or findings. Reports data related to the geotechnical performance of the various underground facility components, including the shafts, shaft stations, access drifts, and waste disposal areas. Volume 1 describes the overall program; Volume 2 provides a compilation of the collected data. Provides information each year on any change in conditions or activities related to the disposal system, as required by 40 CFR § 194.4(b)(4) b. The majority of the items reported are inspections, reports, and modifications to written plans and procedures. In addition, the Annual Change Report provides updates on waste volumes of several parameters and radionuclides upon which the EPA imposes limits. Lists changes in drilling including rates for shallow and deep drilling; pipeline activity; borehole plugging; injection wells; potash, sulfur, and solution mining; and any other new activity related primarily to human intrusion. This report generates data needed to demonstrate compliance with 40 CFR 194.33. The DOE uses Performance Assessment (PA) to simulate the expected long-term performance of the WIPP. COMPs are used to indicate conditions that are not within expected PA data ranges or conceptual model assumptions, and to alert the project to unexpected conditions. These assessments, in part, demonstrate compliance with 40 CFR 194.42 monitoring requirements. Examples of COMPs include waste activity, changes in groundwater conditions, and creep closure rate. Includes determination of the elevation of each of the existing subsidence monuments and the WIPP baseline survey, and of the National Geodetic Survey's vertical control points. Documents the total inventory (stored and projected) of transuranic (TRU) waste as defined by the TRU waste sites to provide current TRU waste inventory information. As required by the WIPP Land Withdrawal Act (LWA), this document reports the status of the project's compliance with a variety of environmental protection laws and regulations. aThe entry in this column is the most recent report available. 40 CFR § 194.15(a)(1) requires the submittal of "all additional geologic, geophysical, geochemical, hydrologic, and meteorological information." Information related to this requirement is provided in Sections 15.8.1.1 through 15.8.1.5. Since the preparation of the CRA-2009, no new geologic mapping has been reported and no new WIPP monitoring wells have been drilled at new locations. Existing WIPP monitoring wells in deteriorated condition have been replaced and/or plugged and abandoned, as discussed in Appendix HYDRO-2014. The information collected during drilling of replacement wells did not provide new geologic information. In 2011, two exploratory potash boreholes were drilled by The Mosaic Company in township 22S range 31E sections 9 and 10 immediately north of the WIPP Land Withdrawal Boundary. The cuttings and geophysical logs collected from these boreholes (MOS-20 and MOS-21) confirmed the stratigraphy of the geologic units above the Salado Formation, as observed in nearby monitoring wells. As described in Appendix SCR-2014, the DOE continues to screen out the impacts of all tectonic-, magmatic-, and structural-related geophysical processes on the basis of probability and/or consequence. Tectonic activity was used as the siting criterion and for the purposes of determining seismic design parameters for the facility. The intent was to avoid tectonic conditions such as faulting and igneous activity that would jeopardize waste isolation over the long term and to avoid areas where earthquake size and frequency could impact facility design and operations. The purpose of continued monitoring of seismic activity is to maintain a database from which to trend ground motions that the WIPP repository may be subjected to in the near and distant future. The concern about seismic effects in the near future, i.e., during the operational period, pertains mainly to the design requirements for surface and underground structures for providing containment during seismic events. The concern about effects occurring over the long term, after the repository has been decommissioned and sealed, pertains more to relative motions (faulting) within the repository and possible effects of faulting on the integrity of the salt beds and/or shaft seals. During the CRA-2014 monitoring period (October 2007 through December 2012) there were 543 seismic events recorded within approximately 300 kilometers (km) (187 miles (mi)) of the WIPP site. One notable seismic event occurred on March 18, 2012, with a magnitude of 2.4, as recorded by the WIPP's seismic array. This seismic event was associated with a potash mine roof fall that caused cracks and subsidence on the surface. This seismic event occurred 14 km (9 mi) from the WIPP site, and caused no observable damage at the WIPP. The Delaware Basin Drilling Surveillance Program collects seismic information on areas within and outside of the Delaware Basin (defined in 40 CFR 194.2). However, only the Delaware Basin is used as the defining area for data collection and input into PAs. Recorded events that have occurred within the Delaware Basin between 1971 and December 2012 are listed in Table 15-2, Seismic Events in the Delaware Basin. Earthquake catalogs are usually divided into categories according to the magnitude registered for each event. Most catalogs have a section detailing seismic events with a magnitude greater than 3.0 because this is the point at which most seismic events can be felt. Below the magnitude of 3.0, most events are very seldom or barely felt. Only 62 seismic events have been reported with a magnitude greater than 3.0 within 300 km (187 mi) of the WIPP site. Of these 62 events, only four have occurred in the Delaware Basin. The closest seismic event with a magnitude of 3.2 occurred on October 19, 1997, 14 km (9 mi) from the WIPP site, and was the result of a roof fall in one of the local potash mines. *Source: seismic events for calendar years 1990 through 2012 compiled from (U.S. DOE 2008a; U.S. DOE 2009b; U.S. DOE 2010a; U.S. DOE 2011a; U.S. DOE 2012d). New hydrogeochemical information has been collected and summarized since the CRA-2009. This new information is described in detail by Domski et al. (Domski et al. 2011) and in Appendix HYDRO-2014. Groundwater sampling for the geochemical evaluation has been performed in replacement wells and selected older wells. The last major geochemical evaluation of the Culebra Dolomite Member groundwater was performed by Domski and Beauheim (Domski and Beauheim 2008) based on samples from 59 wells. The more recent Culebra analyses in Domski et al. (Domski et al. 2011) are an update of Domski and Beauheim (Domski and Beauheim 2008). Domski et al. (Domski et al. 2011) provides some updated Culebra information, confirming the distribution of Culebra geochemical facies, and primarily contains geochemical analysis for the other hydrologic units above the Salado Formation present near the WIPP site. The spatial distribution of these facies is consistent with the locations of the Rustler Formation halite margins, the distribution of transmissivity in the Culebra, and the areas of known or suspected recharge to the Culebra. No new monitoring well locations have been added to the WIPP monitoring network since the CRA-2009, but several old monitoring wells have either been plugged and abandoned or plugged, abandoned and replaced. Updated hydrologic data and well construction and replacement information are provided in Appendix HYDRO-2014. Appendix HYDRO-2014 describes the new information collected since 2007; a brief summary is provided below. 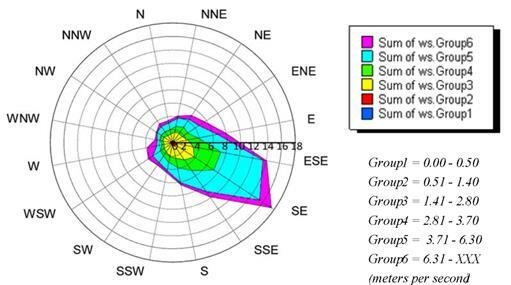 The Culebra monitoring network optimization study was revised (Kuhlman 2010) to identify locations where new Culebra monitoring wells would be of greatest value and to identify wells that could be removed from the network with little loss of information. Details are provided in Appendix HYDRO-2014, Section 9.0. The WIPP groundwater monitoring program has continued monthly water-level measurements with continuous (nominally hourly) fluid-pressure measurements using downhole pressure gauges in all Culebra wells except for the Water Quality Sampling Program wells. Continuous monitoring now also includes Magenta, Bell Canyon Formation, and Santa Rosa Formation/Dewey Lake Redbeds Formation wells. The high-frequency monitoring network continues to provide information about the temporal fluctuations of water levels in the Culebra, due to both natural and human-caused events. Details regarding the WIPP groundwater monitoring activities are described in Appendix HYDRO-2014, Section 7.0. 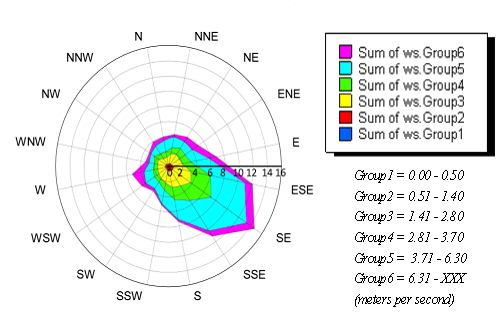 The Meteorological Monitoring Program measures atmospheric data for the WIPP site. This section provides a brief description of the program and updated meteorological data covering the years 2007 through 2011. No anomalous weather events or changes in climatic conditions occurred during that time period. Information related to recent meteorological conditions is provided below. The annual average, maximum, and minimum temperatures from 1990 through 2011 are listed in Table 15-3. *Source: monthly average based on meteorological data in the WIPP Met database from the WIPP Meteorological Station, 10 meters above the ground. 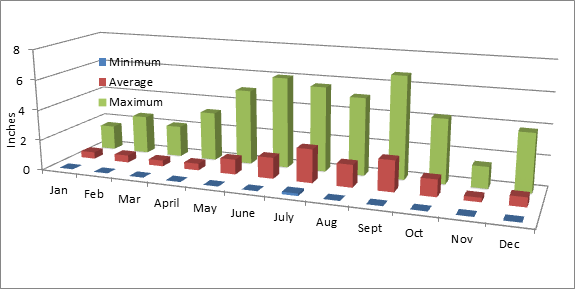 Monthly average, maximum, and minimum precipitation data recorded at the WIPP site from 1990 through 2011 are provided in Figure 15-1. Data are from the WIPP ASERs. *Source: precipitation data for calendar years 1990 through 2011 compiled from (U.S. DOE 2008b; U.S. DOE 2009c; U.S. DOE 2010b; U.S. DOE 2011b; U.S. DOE 2012a). 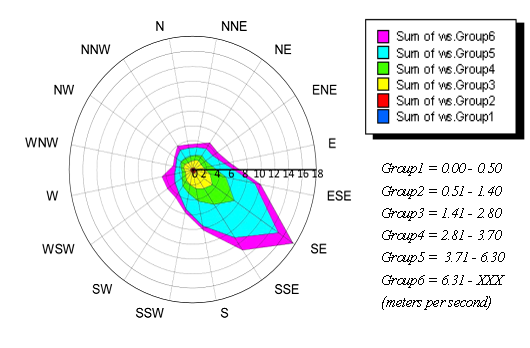 Wind rose plots at 10 meters (m) (33 feet [ft]) indicating the frequency of wind speeds and directions at the WIPP site from 2007 through 2011 are provided as Figure 15-2, Figure 15-3 , Figure 15-4, Figure 15-5 and Figure 15-6. Data are from the WIPP ASERs. 40 CFR § 194.15(a)(2) requires the submittal of "all additional monitoring data, analyses, and results." Information related to this requirement is provided below. The DOE has implemented and/or continued several experimental activities designed to address specific issues and needs of the WIPP repository. In addition, other investigations were initiated to examine the impacts of planned changes. Environmental monitoring programs and references to relevant reports are included in Appendix MON-2014 and Appendix DATA-2014. Data on parameters required for pre-closure and post-closure monitoring, including programs for geotechnical and geoscience monitoring, are described in Appendix MON-2014, which focuses on parameters that may be relevant to the long-term performance of the repository. Appendix DATA-2014, Sections DATA-2.0 and DATA-3.0, describe the data collection procedures and reference the reports related to parameters in the Delaware Basin, including drilling rates, oil and gas production activities, and subsidence monitoring. Appendix DATA-2014, Attachment A, WIPP Borehole Update, provides an updated list of boreholes in the vicinity of the WIPP. 40 CFR § 194.15(a)(3) requires the submittal of "all additional analyses and results of laboratory experiments conducted by the Department or its contractors as part of the WIPP program." Sections 15.8.3.1 through 15.8.3.5 describe experimental work conducted since the CRA-2009 in the areas of WIPP repository conditions and parameters, waste shear strength experiments, magnesium oxide (MgO) characterization and chemistry, actinide studies, and iron and lead corrosion experiments. There were no significant changes in the WIPP repository conditions, chemistry assumptions, or subsurface processes used in PA to establish compliance since the CRA-2009. Appendix DATA-2014, Section DATA-9.0 provides references that describe waste shear strength experiments, actinide chemistry experiments, and iron and lead corrosion experiments and their results with respect to the impact on PA that occurred after the CRA-2009. A detailed description of the current conditions and assumptions used in PA is provided in Appendix MASS-2014. The limits of the range of values for the hydrodynamic waste shear strength have been debated since the Cuttings model was introduced in 1992 (Berglund 1992). Since the Performance Assessment Verification Test, the lower limit has been based on a literature review and the upper limit based on a waste particle size analysis, both being chosen based on a lack of experimental results on a suitable surrogate waste material. (Hansen et al. 1997) developed a surrogate material believed to represent an extreme state of degradation, far weaker than any possible future state of the waste, and used this material to develop the material parameter values used in the Spallings model. The DOE again used this material for a series of tests in a vertical flume to assess the lower limit of the waste shear strength. Based on experimental results that realistically simulate the effect of a drilling intrusion using an accepted surrogate waste material, the DOE proposed that the waste shear strength parameter values have a range of 2.22 - 77.0 Pascals and a uniform distribution (Herrick et al. 2012; Herrick and Kirchner 2013). This range and distribution type is used in CRA-2014. On July 10, 2007, the DOE submitted a letter in response to the EPA's questions pertaining to the efficacy of the MgO supplied to the WIPP (Patterson 2007). The letter included documents which demonstrate the stability of the MgO product in terms of both the stability of the feedstock and of the statistical data on the composition of the product. On February 11, 2008, the EPA approved the DOE's Planned Change Request (PCR) to reduce the safety factor from 1.67 to 1.2 with two conditions: 1) the DOE must continue to calculate and track both the carbon disposed and the required MgO needed on a room-by-room basis; and 2) the DOE must annually verify the reactivity of MgO and ensure that it is maintained at 94% or greater as assumed in supporting documentation (Reyes 2008). On March 16, 2009, the DOE submitted a notification to the EPA of implementation of the 1.2 excess factor for MgO emplacement and verification of 94% or greater reactivity (Patterson 2009). A description of the change in MgO emplacement is given in CRA-2014, Engineered Barriers, Section 44.8.1. The DOE continues to implement the 1.2 excess factor of MgO on a room-by-room basis and to ensure the MgO emplaced in the WIPP has a minimum reactivity of 94%. Experimental investigations to establish the speciation and solubility of actinides under WIPP-related conditions were reinitiated after the CRA-2004 and have continued through the CRA-2014. These investigations initially focused on three areas: (1) the solubility of neodymium, Nd (III), as an analogue for the plutonium, Pu (III), and americium, Am (III), oxidation states, in simulated WIPP brine; (2) the reduction of higher valent Pu (V/VI) by iron to form lower-solubility Pu (III/IV) phases; and (3) the solubility of uranium, U (VI), in carbonate-free WIPP brine. Since the CRA-2009, this has expanded to include various aspects of actinide-relevant brine chemistry, microbial effects, and actinide colloid studies. The details of these experimental studies are given in Appendix SOTERM-2014, Sections SOTERM-2 and SOTERM-3. All results reported in these studies support the existing PA assumptions for geochemistry and did not lead to conceptual model changes in the CRA-2014 PA, although a number of parameters were updated. Since the CRA-2009, a new series of steel and lead corrosion experiments has been conducted (Roselle 2009; Roselle 2010; Roselle 2011a; Roselle 2011b; Roselle 2013). The purpose of these experiments has been to determine steel and lead corrosion rates under more WIPP-relevant conditions. The results of these experiments have led to a revised iron corrosion rate parameter (Roselle 2013). No other changes have been made as a result of these experiments. Appendix MgO-2014, Section MgO-5.3.2.1 provides a description of the effects of MgO on gas generation from anoxic corrosion of steels and other iron-based alloys, while Appendix SOTERM-2014, Section SOTERM-2.3.4 describes the iron chemistry and corrosion assumptions that are implemented in the CRA-2014 PA.
40 CFR § 194.15(a)(4) requires that the DOE "identify any activities or assumptions that deviate from the most recent compliance application." Information related to this requirement is provided in Sections 15.8.4.1 through 15.8.4.6. The status of mining in the WIPP underground repository is shown in Figure 15-7. As of December 31, 2012, Panels 1 through 7 had been mined completely and Panels 1, 2, 3, 4 and 5 were completely filled with waste. Waste was being emplaced in Panel 6 and mining of Panel 7 was completed on December 28, 2012. The geotechnical analysis reports from 2008 through 2012 show that no major ground control problems or events have occurred since the CRA-2009 (U.S. DOE 2008c ; U.S. DOE 2009d; U.S. DOE 2010c; U.S. DOE 2011c; U.S. DOE 2012b). As expected, slow deterioration of ground conditions has occurred in the WIPP underground repository as a result of aging, but this has been mitigated by routine maintenance and the implementation of engineered systems, as needed. The original plans for waste emplacement included the placement of remote-handled TRU (RH-TRU) waste in horizontal boreholes in the walls of waste-emplacement rooms, followed by the emplacement of contact-handled TRU (CH-TRU) waste in containers on the floor of each room. This configuration was planned to be used in all panels in the underground repository. Because CH-TRU waste disposal was approved about six years before RH-TRU waste approval, RH-TRU waste was emplaced in Panels 4, 5, and 6, but not in Panels 1, 2, and 3 (see Figure 15-7). On November 15, 2007, the DOE submitted a PCR to the EPA for approval to emplace a portion of the RH-TRU waste in shielded containers in the WIPP (Moody 2007). The shielded container has approximately the same exterior dimensions as a 55-gallon drum. It has 1-inch thick lead shielding placed between a double-walled steel shell. The external steel wall is 1/8-inch thick, and the internal steel wall is 3/16-inch thick. The lid and the bottom of the containers are made of carbon steel and are 3 inches thick. The containers are designed to hold a 30-gallon container filled with RH-TRU waste, and would be shipped to the WIPP in HalfPACT transportation containers. The shielded container would be handled and emplaced like CH-TRU waste containers because the surface dose rate for a shielded container would be no higher than 200 millirem/hour. Even though the RH-TRU waste in shielded containers will be handled as if it were CH-TRU waste, these containers will still be recorded as RH-TRU waste in the WIPP Waste Data System, and the volume of the waste will be counted against the limit of 250,000 cubic feet (7,080 cubic meters) of RH-TRU waste, as set by the Consultation and Cooperation Agreement between the DOE and the State of New Mexico. On December 7, 2007, the EPA sent the DOE its first letter with the results of a preliminary review and comments on the shielded container PCR and requested additional documentation (Reyes 2007). The DOE submitted supplemental information on April 30, 2008, and October 29, 2008, in response to the EPA's request (Moody 2008a and Moody 2008b). On March 25, 2011, the EPA determined that the DOE had fulfilled all documentation requirements set forth by the EPA and had demonstrated that the use of shielded containers in the repository would not affect facility compliance with either 40 CFR Part 191or 40 CFR Part 194 (Edwards 2011a). The EPA proposed the approval of the shielded container assembly for use at the WIPP, pending the solicitation and resolution of public comments. The EPA opened an informal 60-day comment period, which was later extended to 90 days at the request of the stakeholders and closed on June 24, 2011. The EPA considered all comments submitted and found that no new technical issues had been raised. On August 8, 2011, the EPA issued its technical approval of the DOE's PCR for the emplacement of RH-TRU waste in shielded containers with one condition (Edwards 2011b): prior to shipping shielded containers to the WIPP, the DOE will demonstrate a consistent complex-wide procedure to ensure that shielded containers containing RH-TRU waste remain below the WIPP LWA surface dose rate limit for CH-TRU waste of 200 millirem per hour. Several new research projects have been initiated at the WIPP. Although these projects are not related to the expected performance of the repository, they are described here because they are being performed in the WIPP underground facility. The WIPP underground repository is a desirable location for these experiments because it provides an environment shielded from cosmic radiation that would otherwise interfere with the experiments. Equipment used during these experiments will be removed before closure of the repository. The Segmented Enriched Germanium Assembly (SEGA) and the Multiple Element Germanium Array (MEGA) projects are being performed to investigate double-beta decay, a rare type of nuclear decay that provides information on the mass of the neutrino. The SEGA and MEGA projects are being performed by a collaboration of several universities, with Stanford University serving as the lead. The SEGA and MEGA experiments have been ongoing since 2008. Los Alamos National Laboratory is leading the Enriched Xenon Observatory (EXO) project, also in the WIPP underground repository. This project is investigating neutrinoless double-beta decay. The first two clean room modules for the EXO project were successfully placed in the WIPP underground in 2007. The detector for the EXO project, called the Time Projection Chamber (TPC), was installed in January 2010. Data-taking mode began when the EXO detector was filled with xenon containing 80% xenon-136. Construction of the EXO is approximately 90% complete. Experimental modules continue to be assembled, outfitted, tested and emplaced in the WIPP underground. On May 28, 2009, the DOE submitted to the EPA the notification of intent to emplace the Dark Matter (DM) TPC in the northern part of the North Experimental Area in the WIPP underground (Moody 2009a). The EPA approved the DM-TPC on July 23, 2009 (Edwards 2009a). The experiment was assembled in the WIPP underground in 2010. The DM-TPC continues to operate safely and reliably. On January 8, 2009, the DOE submitted to the EPA the notification of intent to begin the Low Background Radiation Experiment (LBRE) (Moody 2009b). The LBRE is designed to examine the effects of very low background radiation on bacteria. The EPA approved the intent to begin the LBRE on January 28, 2009 (Edwards 2009b). Experimental protocols were developed and incubators were emplaced above ground and underground. Experiments have been ongoing in the WIPP underground since 2009. A Planned Change Notice (PCN) is a formal submittal of information to the EPA that describes minor, insignificant changes to activities and conditions at the WIPP that are different from those described in the compliance baseline. A summary of the PCNs submitted since the CRA-2009 is provided below. On August 11, 2011, the DOE submitted to the EPA a PCN to initiate mining activities for the Salt Disposal Investigations (SDI) project in the WIPP underground (Ziemianski 2011a). The objective of the SDI experiment is to investigate thermal and hydro-geochemical responses to temperature sources in excess of 160º Celsius located in bedded salt. On November 17, 2011, the EPA agreed that the DOE may conduct the initial preparatory phase of the SDI program and found that the mining phase of the SDI activities will not adversely impact the WIPP's waste handling activities, air monitoring, disposal operations, or long-term repository performance (Edwards 2011c). The initial preparatory phase of the mining project began on December 1, 2011. On June 20, 2012, the DOE notified the EPA (Franco 2012a) that an additional component, and possible alternative to the SDI project, had been developed entitled the Salt Defense Disposal Investigations (SDDI). The SDDI project would test an in-drift emplacement concept with thermal loads more closely aligned with the DOE defense high-level waste canisters. On May 21, 2010, the DOE submitted to the EPA a PCN to employ a polyethylene liner inside some standard RH-TRU waste canisters to shield neutron-emitting waste destined for disposal at the WIPP (Moody 2010). On February 14, 2012, the DOE submitted a PCN, based on operating experience and historical data, to inform the EPA that a process was being instituted to emplace MgO on every other row of waste containers, in contrast to emplacing MgO on every waste stack (Franco 2012b). Historical data showed the MgO excess factor on a per room basis to range from 1.22 to 2.85 when MgO was placed on every stack of waste. These values were higher than the excess factor of 1.2 mandated by the EPA's letter dated February 11, 2008 (Reyes 2008). The PCN also described the process that requires the Waste Handling Engineer to continue to calculate the excess factor at the end of each shift and to direct the placement of additional MgO if the excess factor dropped below 1.2. The EPA agreed to this operational change in an email from Peake to Franco dated July 13, 2012. Details regarding this change can be found in Appendix MgO, Section MgO-2.1.4. A PCR is a formal submittal of information to the EPA that describes and requests approval for the implementation of more complex changes to activities and conditions at the WIPP that are different from those described in the compliance baseline. A summary of the PCRs submitted since the CRA-2009 is provided below. 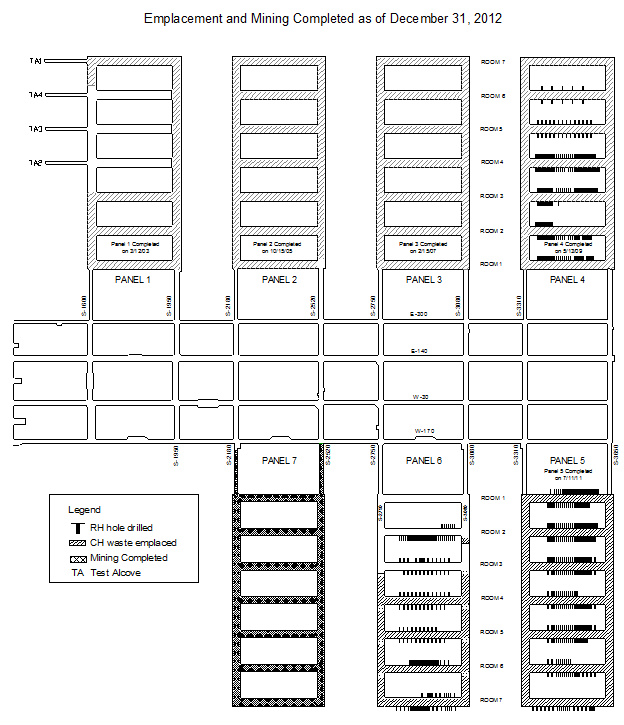 On August 30, 2011, the DOE submitted a Repository Reconfiguration PCR to the EPA to relocate Panels 9 and 10 from the main north-south access drift to south of the existing Panels 4 and 5 (Ziemianski 2011b). The DOE stated that relocating Panels 9 and 10 to south of the existing Panels 4 and 5 will enhance worker safety and reduce maintenance requirements by providing a more stable geotechnical environment for the two new waste emplacement panels in the repository. On September 28, 2011, the DOE submitted to the EPA a PCR for panel closure redesign (Ziemianski 2011c). The DOE has requested that the EPA modify Condition 1 of the Final Certification Decision for 40 CFR Part 194 by replacing the current approved panel closure design, "Option D," with the proposed design, Run-of-Mine Panel Closure. Condition 1 of the Final Certification Decision for 40 CFR Part 194 specifies that the panel closure system to be used in the WIPP repository be "Option D," as specified in the CCA (U.S. DOE 1996). "Option D" specified that certain components be constructed using Salado Mass Concrete. In 2007, the DOE initiated hydrogen and methane monitoring to gather data to determine more realistic accumulation rates for these gases in filled panels. More realistic accumulation rates for hydrogen and methane could be used to establish a panel closure design that would be less complex than the Option D design. On December 22, 2011, the EPA provided a set of initial questions and comments to the DOE focusing on the justification for Run-of-Mine Panel Closure representation and its parameters in the reconfiguration PCR PA that were different from those in the 2009 Performance Assessment Baseline Calculation (Perrin 2011). On April 17, 2012, the DOE replied to the initial set of review questions and comments related to the PCR for replacing the current "Option D" panel closure system (Franco 2012c). In 2012, the DOE submitted a PA, Panel Closure System-2012, for the proposed panel closure redesign. The results of the PA demonstrated that the WIPP will remain in compliance with the containment requirements found in 40 CFR §191.13. 40 CFR § 194.15(a)(5) requires that the CRA-2014 include "a description of all waste emplaced in the disposal system since the most recent compliance certification or recertification application. Such description shall consist of a description of the waste characteristics and waste components identified in § 194.24(b)(1) and § 194.24(b)(2)." Information related to these requirements is provided in Sections 15.8.5.1 and 15.8.5.2. 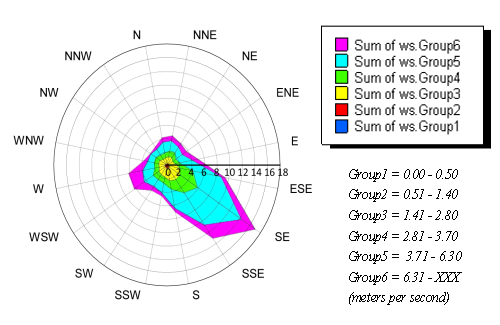 The status of waste emplacement in the WIPP underground repository is illustrated in Figure 15-7. Additional detail is provided in Section 24, Waste Characterization. Section 24 provides an updated waste inventory of waste anticipated to be emplaced in the WIPP and waste that has already been emplaced since the CRA-2009. Section 24 also reports an analysis of the impacts of waste inventory on the performance of the WIPP disposal system. Information about the limits imposed by the DOE on significant components or characteristics of the waste to ensure that they are consistent with assumptions made for the CRA-2014 PA is also provided in Section 24. There have been five inventory updates (ATWIR-2008, ATWIR-2009, ATWIR-2010, ATWIR-2011 and ATWIR-2012) since the CRA-2009. The DOE used the ATWIR-2012 data for the CRA-2014 inventory, after it was scaled for PA. The scaled inventory was documented in the Performance Assessment Inventory Report - 2012 (Van Soest 2012). 40 CFR § 194.15(a)(6) requires the submittal of "any significant information not previously included in a compliance certification or recertification application related to whether the disposal system continues to be in compliance with the disposal regulations." The information required by this section of the certification criteria is provided in the sections and appendices of the CRA-2014. The DOE believes that this information demonstrates that the WIPP continues to comply with the disposal regulations. 40 CFR § 194.15(a)(7) requires the submittal of "any additional information requested by the Administrator or the Administrator's authorized representative." There currently are no outstanding requests from the EPA for additional information. As such, the DOE is in compliance with this certification criterion. 40 CFR § 194.15(b) states, "To the extent that information required for a re-certification of compliance remains valid and has been submitted in previous certification or re-certification applications(s), such information need not be duplicated in subsequent applications; such information may be summarized and referenced." The DOE has followed this direction in the preparation of this recertification application. To the extent appropriate, information from the CCA, the CRA-2004, and the CRA-2009 that remains valid and unchanged is not repeated in this recertification application; instead, it is summarized and incorporated by reference. The information in this section and in the other sections and appendices of the CRA-2014 establishes that the DOE continues to demonstrate compliance with the requirements of section 194.15.